I’ve always pushed back against the idea that reviews of Community should solely be about what in the episode was funny—or suggest that the episode only succeeded or failed based on how often it made me laugh. I’ve always skewed more toward analyzing the show’s story development and character arcs, and if that means I occasionally get lost a bit in the woods, I’d rather be there than trying to explain to you exactly why I thought something was funny. That’s a fool’s errand, too often based on the idea that there is some objectively “correct” way to watch things or understand them. What’s funny to me won’t always be what’s funny to you, because humor is really hard-wired into us based on individual experiences and the lives we’ve lived. For instance, I find Community riotously funny at its best, but there are plenty of people who find it a self-indulgent wankfest. Those people aren’t “wrong”; they’re just looking for something else out of their comedy and might find it in Parks & Rec or Trophy Wife or It’s Always Sunny or any one of the many, many great comedies on TV right now. For instance, does it do you any good for me to tell you that I laughed the hardest I’ve laughed all season at the sequence where Abed and Annie play the VCR game. There are a lot of reasons for this, mostly having to do with my love of unrestrained weirdness and an affection for those old games, which never worked as well as they purported to but were still sort of entertaining all the same. But I don’t know that outlining them in exhaustive detail is going to help you understand the episode any better—or even understand my reaction to it. And yet at the same time, laughing so hard at something can only make me feel favorable feelings toward the episode as a whole, so even though I can poke and prod at it and find things wanting, I keep coming back to that singular scene and remembering the episode as being a really solid one in a very good season. 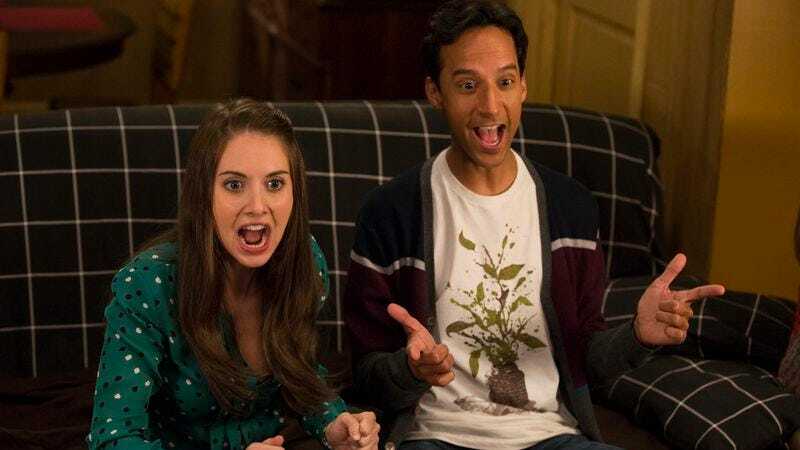 I found the Annie and Abed story to be a step up over the other, which had some funny moments but also struggled to be anything other than yet another chance for the characters to go a little crazy. (It’s gotten to the point where now, when Hickey starts tying up Jeff, Britta immediately jumps in to help out with the hogtying, so comfortable is everyone with the chaos.) I liked that the storyline offered Shirley quite a bit to do—and Yvette Nicole Brown’s playing of the moment when Shirley turns on a dime from being concerned about the contraband textbooks to, “OKAY, HERE’S WHAT WE’RE GONNA DO” was beautiful—but it also felt like it wandered into a cul de sac of its own making. It was playing out the story of what happens when a group of people comes across a stash of money or drugs or something, then that group splinters apart because it can’t handle the stress of criminal behavior. (Look, just think of A Simple Plan, okay?) Yet because every other Community story is “the group almost comes to blows, then realizes that everybody should stay friends,” there was less room for the show to play with this story type than you might have expected. There were good moments sprinkled throughout, and I loved the resolution with the books being misprints, but even now, shortly after watching the episode, this storyline is beginning to fade. However, the rest of this was great stuff. I have no particular attachment to Spencer from Harmontown, because I’ve never listened to Harmontown, but I thought he made a weird amount of sense as Annie’s younger brother, and he handled his latest moment in the spotlight with a quiet aplomb. He was funny but never tried to make himself too funny, instead just sort of showing up like he was supposed to be on Community tonight and would be having a sandwich afterward. Similarly, Vince Gilligan’s role as the host of the VCR game had the potential to go disastrously wrong, but he seemed to be having a lot of fun as this over-exaggerated version of a low budget actor in the ‘80s. (My favorite joke: The moment when he switches hats and says it’s time to go to the city. What?) As mentioned, this made me laugh at length, and almost all of that was the sheer weirdness of Gilligan’s character, along with the way Annie and Abed got so into following his completely bonkers instructions. But, again, I don’t know what good that does you. At its best, Community has so many jokes flying around at any given time that something you laugh at might be something I completely missed and vice versa. “VCR Maintenance And Educational Publishing” probably isn’t an episode that anyone is going to think about fondly in years to come, when recalling their five or 10 favorite Community episodes, but it has moments—both humorous and emotional—where the show attains everything it’s capable of. There’s a lot of loneliness at the core of Community, and even in its happiest moments—say, a guy telling a girl he’s sorry and realizing she still likes him—it’s a show that realizes good things are never too far from bad. I laughed slightly more at the VCR game, but I would not argue too strenuously against you if you laughed even more at the Dean’s rap. That was some fantastic stuff, as was his realization that he had no idea where it came from. Things Annie and Rachel have in common: They both have Waterpiks. Things Anthony and Abed have in common: They both like to play games, I guess. It’s best not to flip any coins, because you never know when a coin will create a parallel universe. And it’s best not to play Rock, Paper, Scissors because that could spawn nine parallel universes. Another big laugh for me: the guy slipping and falling in all of the water that had been spread on the floor because of Abed’s grand romantic gesture. He hired a stuntman! I do like that the handful of photos of Annie and Abed together on the apartment’s walls all appear to be press stills from the show’s publicity materials. Chang has just randomly and out of nowhere turned into a very funny, perfectly used character again, and I’m not sure why. Anybody have any good theories?